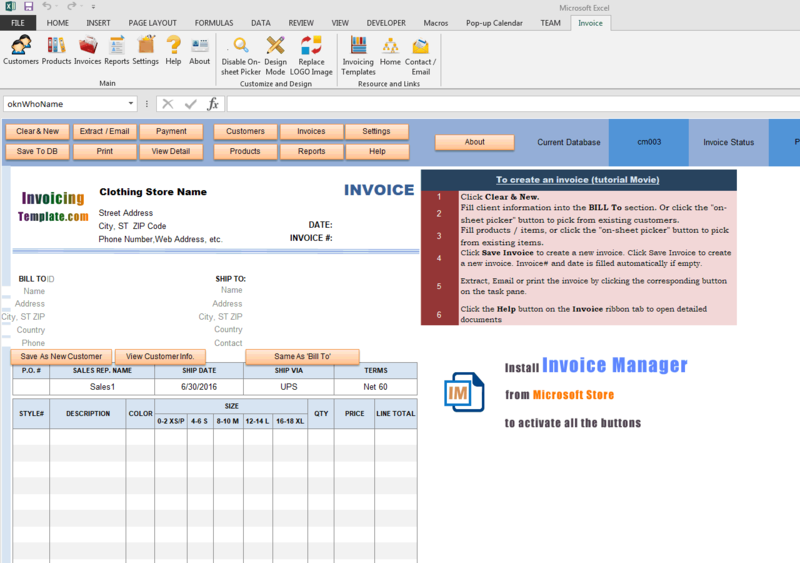 cm003 now includes the customized invoice template for the latest version of Invoice Manager for Excel. 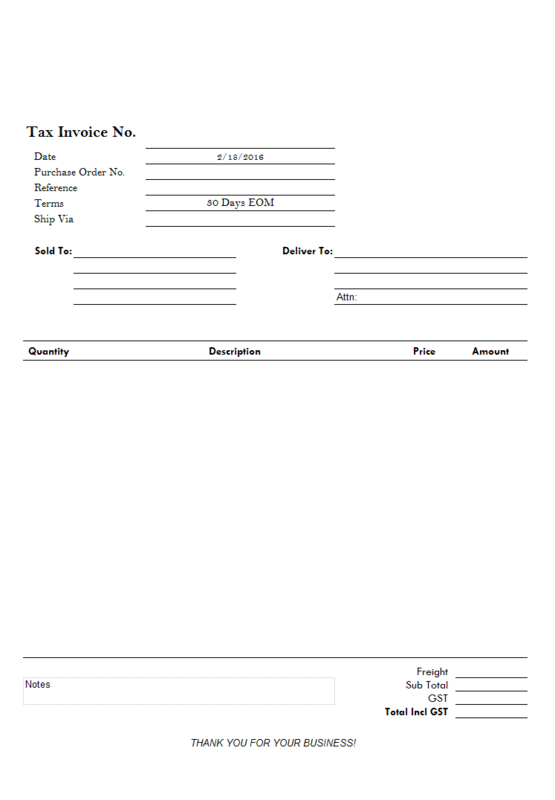 This is what you will see when you open clothing-invoice-template-size-breakdown.xlsx. 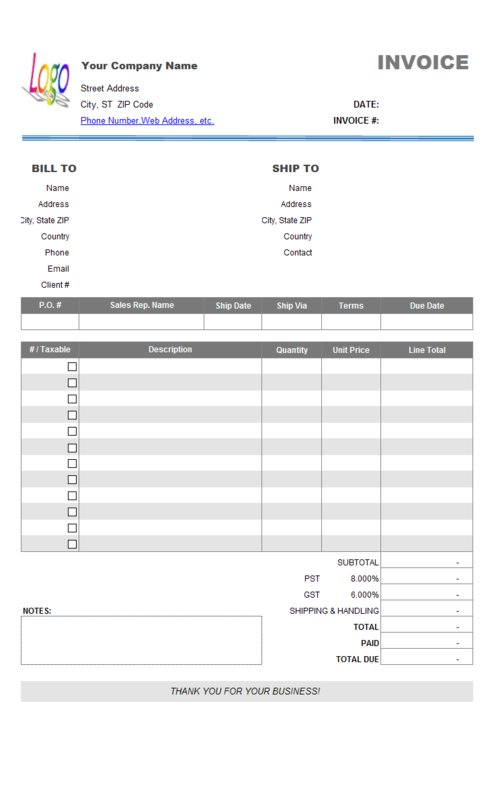 We've already published an invoice receipt template for clothing stores and shops here on InvoicingTemplate.com, at Free Clothing Shop Receipt (c6001). 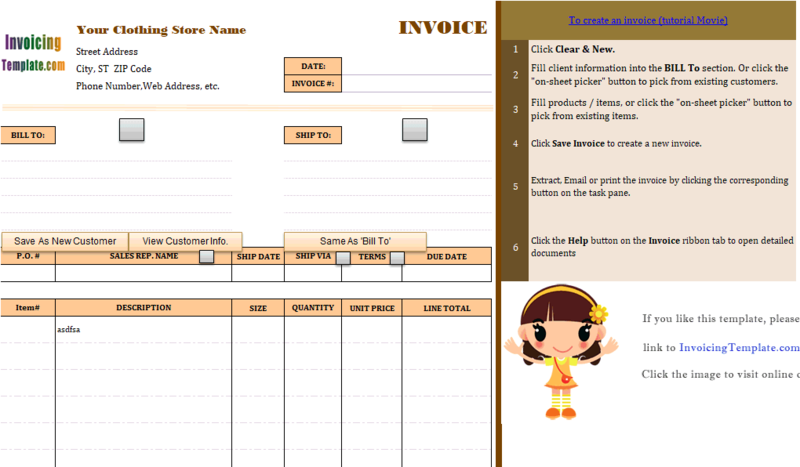 It is also available on our company web site, at Clothing Store Invoice Template. The c6001 template has a "Size" column where a clothing or company could specify the size of each item like "XS", "M" or "L" etc. The "size" column in c6001 is implemented as a general purpose text column that allows any input. 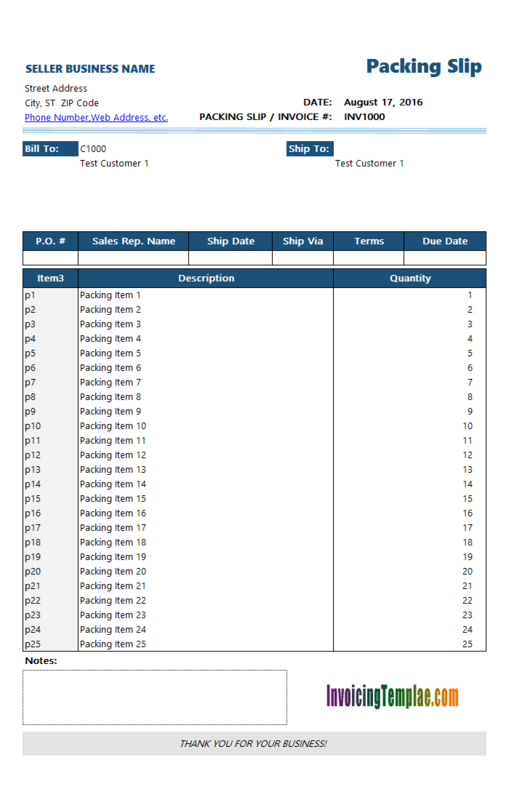 This means the c6001 template could be used by any other stores and manufacturers too that have the need to detail the size information of each product / item sold. 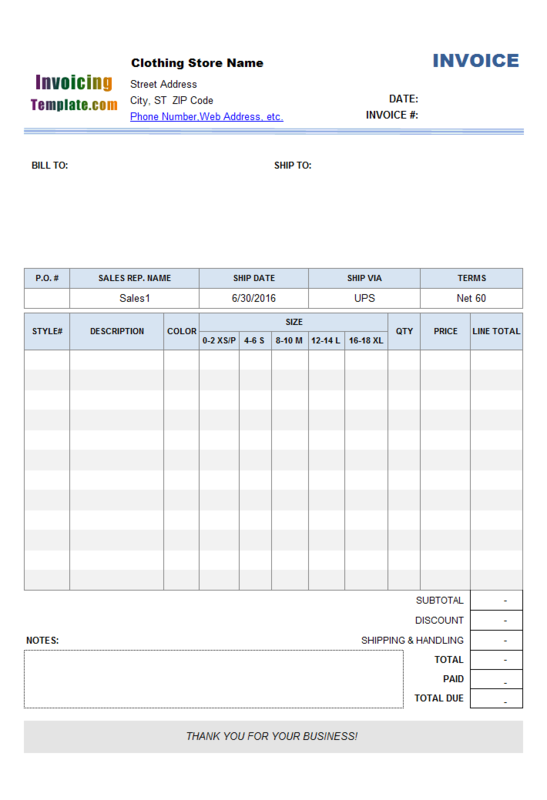 This implementation, cm003 (Clothing Store (Manufacturer) Invoice Template with Size Breakdown) goes one step further by breakdown the size column into 5 columns, with columns headings "0-2 XS/P", "4-6 S", "8-10 M", "12-14 L" and "16-18 XL". The "Quantity" column is also provided that calculates sum of all the size breakdowns using Excel formula. 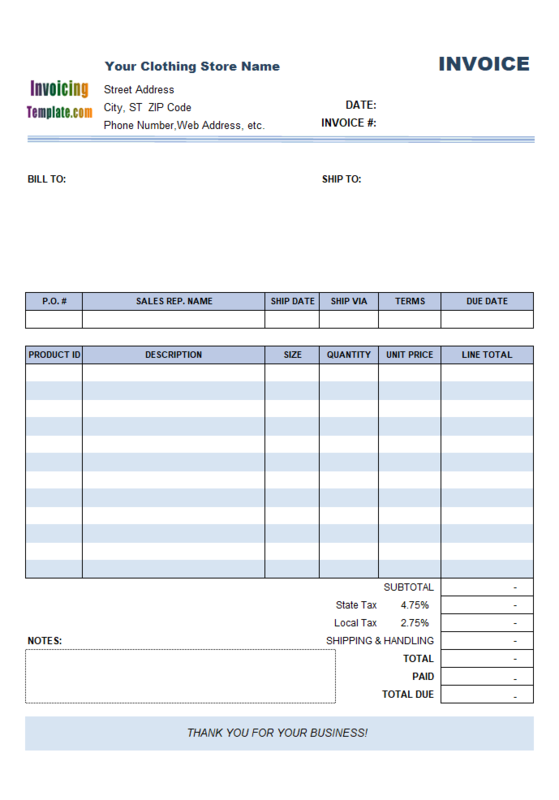 As a general rule of creating / customizing invoice template, a cell with formula assigned to it cannot be editable when you create an invoice (see the tutorial movie). To archive this goal we have set all the quantity cells to be locked. 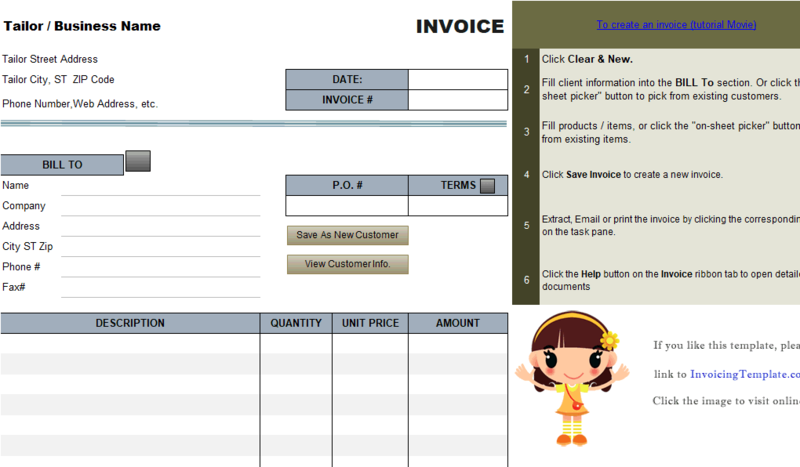 If you need to set "Lock" property yourself on designing an invoice template (to prevent Excel from showing a warning on the cells that have formulas when the spreadsheet is protected), first you have to switch the template into design mode by clicking the "Design Mode" button on the "Invoice" worksheet, and then drag your mouse to select all the cells which you want to set the "lock" property for. And then, right-click one of the selected cells and then choose "Format Cells". On the "Protection" tab, check or uncheck the "lock" property to make the cells editable / not editable when the spreadsheet is protected. 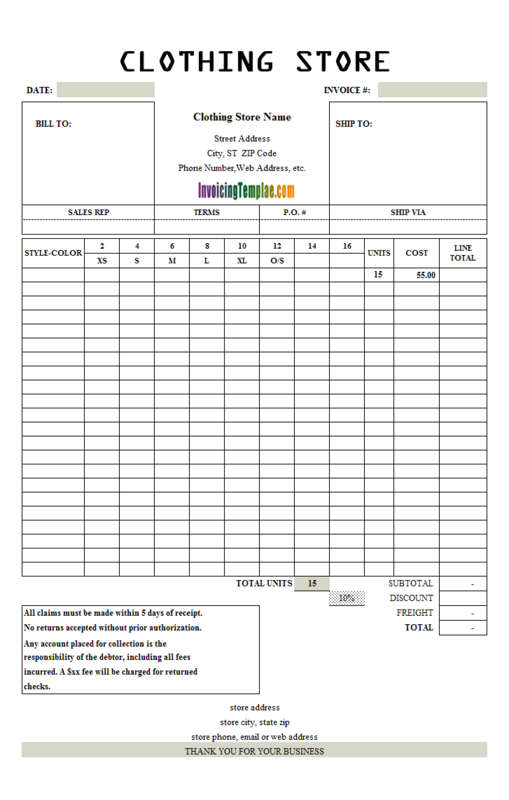 Clothing Store (Manufacturer) Invoice Format with Size Breakdown has other two columns that designed specifically for clothing store and manufacturers that are "Style #and Color". The actual usage of these fields could vary from business and business, but general speaking, they allow you to further detail the items and products you are selling. There is also a "Discount" field on the bottom of the form, which is implemented as an amount value. The form firstly calculates the subtotal (cell name "oknSubtotal") using Excel formula "=SUM(oknLineTotal_1:oknLineTotal_12)", and then calculates Total (cell name "oknTotal") using Excel formula " =ROUND(oknSubTotal - oknDiscount + oknShippingCost + IF(oknTaxType = 0,0,IF ( oknTaxType = 1,oknTax1, oknTax1 + oknTax2 )), 2)". 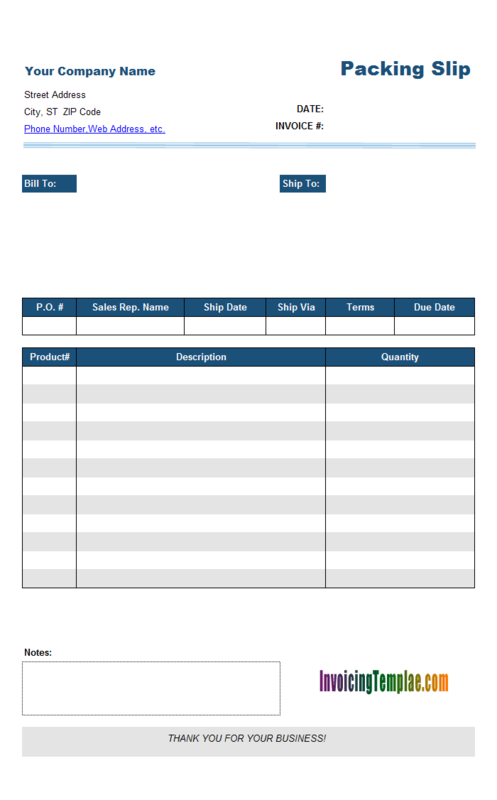 This is one of the advantages of using Excel formatted invoice templates as you can easily using formulas to define the relationships between cells and fields. 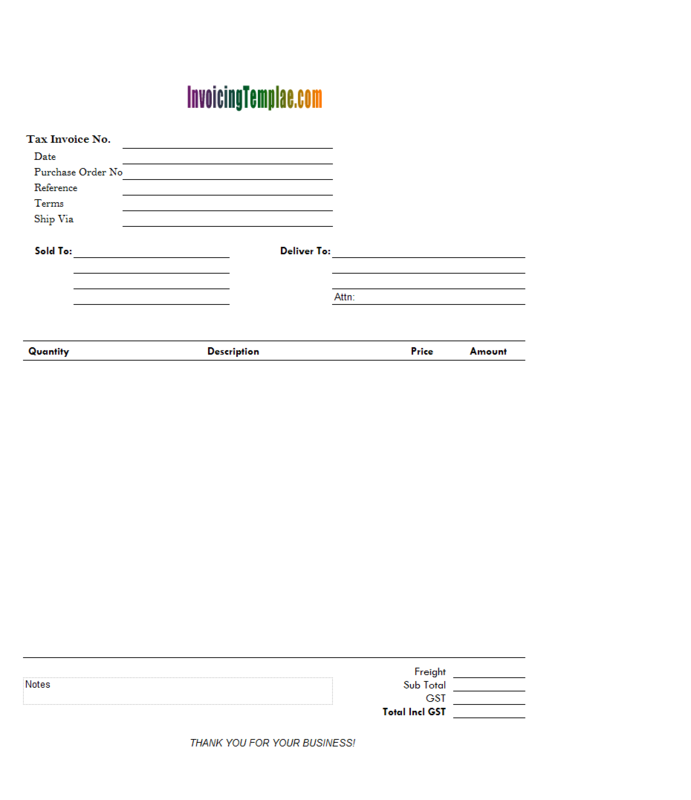 Different businesses have different invoicing requirements. 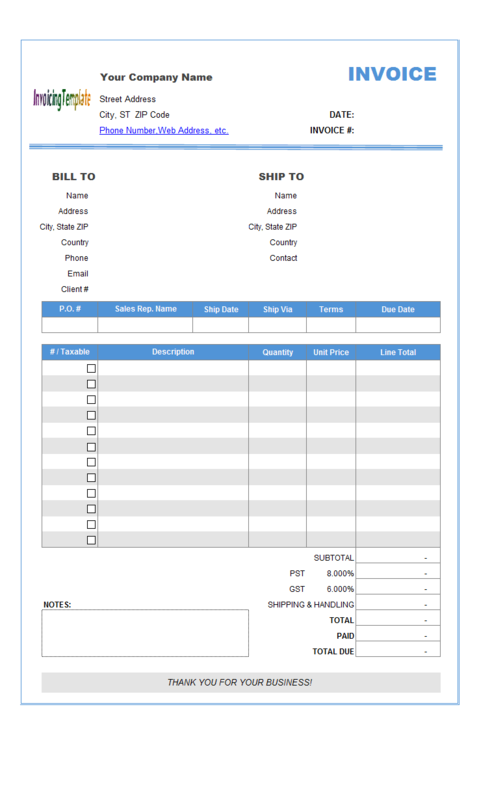 For a clothing store or manufacturer, the new fields (custom fields) added in this invoice template could be useful in many situations. 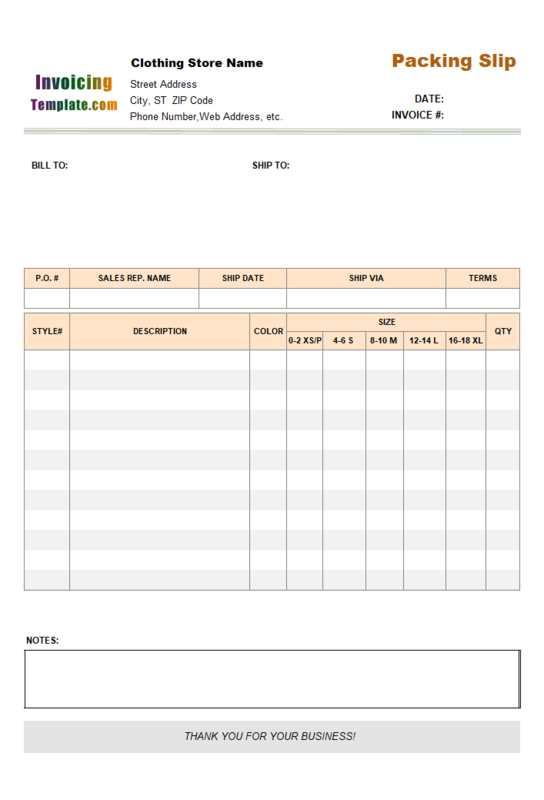 Like other form designs here on InvoicingTemplate.com, Clothing Store (Manufacturer) Format with Size Breakdown is free (offered to you at a price of 0.00USD). It works on Windows XP and all newer versions of Windows, and Excel 2007, 2010, 2013 or 2016. 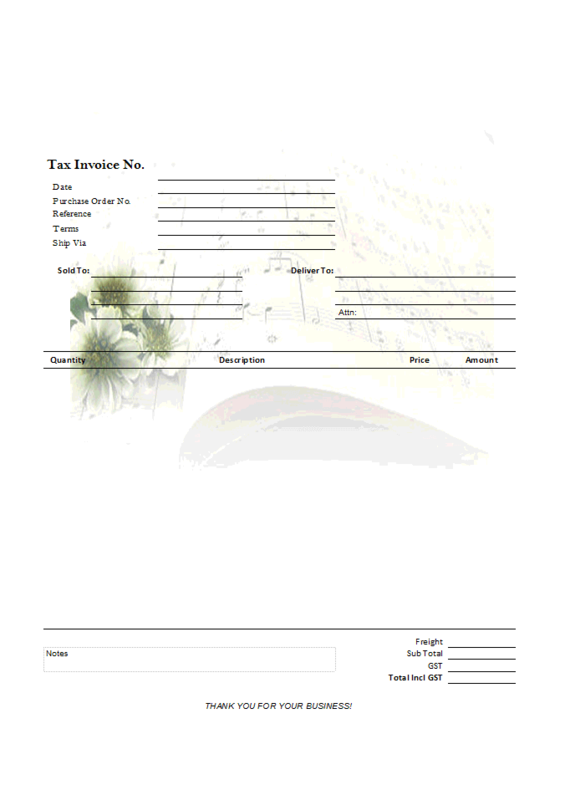 Replaced the default logo image with the one that shows "InvoicingTemplate.com". Merged the two lines for the "Thank you for your business!" line.